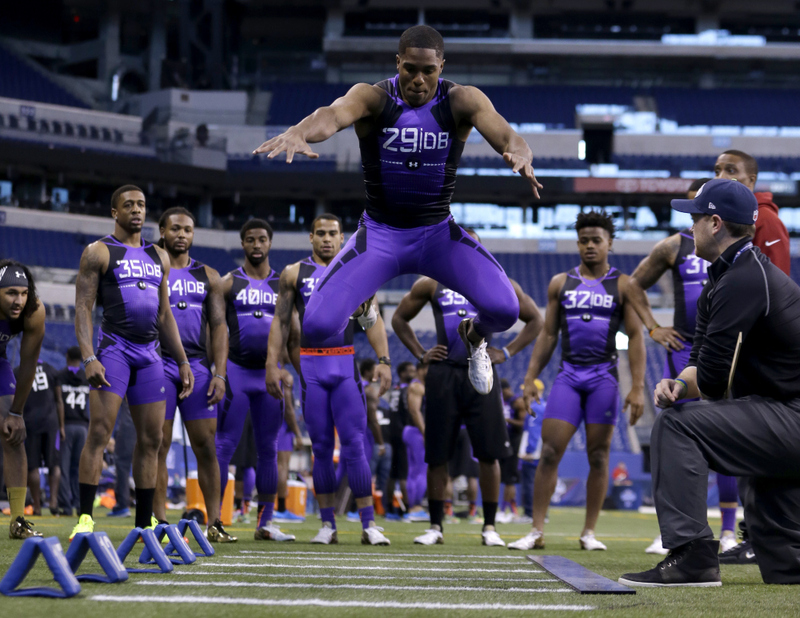 UConn corner Byron Jones set an NFL Combine record by broad jumping 12′ 3″ on Monday. The 2015 NFL Combine is now in the books. Yesterday I discussed the offensive players that stood out during the Combine. Today I discuss the defensive players. The defensive line is a deep group this year, especially what I will refer to as edge rushers. Many of the edge rushers played defensive end at the college level. Depending on their size and agility, some of these players may be asked to convert to linebackers. Vic Beasley, DE/OLB, Clemson (6-3, 246 lbs. ): Beasley may have created the most buzz of anyone at the draft. The former running back turned defensive end put on 20 pounds and it didn’t slow him down one bit! Even at 246, Beasely moved easily through the on-field drills. Beasley will be asked once again to change positions and play linebacker in the pros. He ran a 4.53 40 yard dash which was the fastest of the defensive line group. His other measurables were 35 bench press reps (#1 DL), 41” vertical jump (#3 DL), 10’10” broad jump (#3 DL), 6.91 3 cone drill (#4 DL) and 4.15 short shuttle (#4 DL). It’s entirely possible he vaulted himself into the top 10 of the draft. Leonard Williams, DT/DE, (6-5, 302 lbs. ): Leonard Williams is called the Big Cat for a reason. He is massive, but he moves extremely well. He could either be a 3 technique in a 4-3 scheme or a defensive end in a 3-4 scheme. He has good length and looks like he weighs less than 300 pounds. He ran a 4.97 40 which is impressive for a man his size. He was very smooth in the on-field drills. He could easily be one of the first two picks of this draft. Malcom Brown, DT, Texas (6-2, 319 lbs. ): Brown is steadily moving up the draft boards. He is a prototypical 4-3 defensive tackle. He has quick feet and can be very disruptive. He ran a 5.05 40 which is good for someone 319 pounds. He started off as more of a second day pick, but I think he may have worked himself into the first round. Randy Gregory, DE/OLB, Nebraska (6-5, 235 lbs. ): Has the length that you would like for a 4-3 defensive end, but will likely move to linebacker. He lost weight prior to the Combine, likely to improve his speed and agility. He looked fluid in the drills. He shows very good explosion in his first step. He ran a 4.64 40 yard dash (#7 DL), had a 36.5” vertical jump (#7 DL) and had a 10’5” broad jump (#5 DL). Danny Shelton, DT, Washington (6-2, 339 lbs. ): Massing defensive linemen with surprising movement skills. He is always around the ball and led his team in tackles, which is rare for a defensive tackle. Despite his size, he rarely came off the field. Has the size to be a prototypical nose tackle for a 3-4 team. Some have compared him to Haloti Ngata, but that’s big shoes to fill. Could easily be a top 10 pick. Bud Dupree, DE/OLB, Kentucky (6-4, 269 lbs. ): Freakish athlete that changed positions on almost a yearly basis at Kentucky. The trick will be to find the right spot for him. Measureables blew up the Combine. Ran a 4.56 40 yard dash (#3 LB), had a 42” vertical (#2 LB), 11’6” on the broad jump (top LB and #3 for the entire Combine). Worked out with the linebacker group, but may be a better defensive end. Dante Fowler, DE/OLB, Florida (6-3, 261 lbs. ): Versatile player that bounced all over for the Gators. Able to rush the passer from a two-point or three-point stance. Looked good in on-field drills and looked smooth in linebacker drills. Ran a 4.60 40 yard dash which was the #4 defensive lineman. Draft stock is improving and could possibly be a top 10 pick. This group is always hard to determine depth because of the number of players that may convert from defensive end to linebacker. It looks like several of the edge rushers may end up being linebackers, so it looks like this could also be a deep group. Kwon Alexander, OLB, LSU (6-1, 227 lbs. ): Alexander is likely a fit as on the outside, probably in a 4-3 scheme. At times he has problems diagnosing plays and has some wasted motion, but if he is turned loose, he can create some havoc. He ran a 4.55 40 yard dash (fastest LB). I believe he will be a core special teams player immediately and will challenge at some point for a starting outside linebacker spot. Jordan Hicks, OLB, Texas (6-1, 236 lbs. ): Very talented and athletic, but had injury problems. Was a key to the Longhorns defense when he was healthy. Looks smooth and fluid in the on-field drills. Showed good lower body explosion by vertical jumping 38” (#4 LB) and 10’4” broad jump (#3 LB). He also ran a 4.15 short shuttle (#5 LB). I think Hicks could be a good value pick that someone could get late on day two or day three. He is probably better on the outside. Paul Dawson, ILB, TCU (6-0, 235 lbs. ): Running stuffing linebacker that will likely play on the inside. Had a very disappointing Combine. When you look at tape, he is always around the ball, but he ran 4.93 40 yard dash. That was barely faster than the fastest offensive lineman. His pro day will be very important for him to improve his numbers. It’s possible that he didn’t train much for the Combine so he wasn’t prepared. If that’s the case he has a lot of work to do between now and his pro day. The group of corners is relatively deep for this draft. That’s a good thing because everyone needs corners in this league. The safeties group isn’t a great group though. There is likely only one first round safety. Trae Waynes, CB, Michigan State (6-0, 186): Likely cemented his claim as the top corner. He is most comfortable when he can press receivers and he can be a shutdown corner than covers the opponent’s best receiver. At times he can get a bit grabby, so he will need to clean that up, but that’s just a matter of trusting his talent and technique. He ran a 4.31 40 yard dash which was tops for the defensive backs. His other measureables were 26 bench press reps (#5 DB) and 38” on the vertical jump (#6 DB). He is likely a top 10 pick. Byron Jones, CB, UConn (6-1, 199 lbs. ): Was not a well-known name coming into the Combine, but people sure know who he is now! Jones created a huge buzz by breaking the Combine record for the broad jump. He jumped 12’3” in the broad jump and also had a 44.5” vertical jump, which was the best for the defensive backs and #2 for the entire Combine. He also ran a 6.78 3 cone drill (#5 DB) and a 3.94 short shuttle (#3 DB). Jones looked fluid in the on-field drills and will make scouts look again at UConn game tape. Landon Collins, S, Alabama (6-0, 228 lbs. ): Collins is a thick built safety that is better in the box than in deep coverage. However, his big hitting style sets a physical tone that makes his defense play better. The Combine isn’t the place for Collins to shine. If you want to see the best part of his game, you have to put on game tape. He is the top safety this year, but if he ends up as a day one pick, it will be late. Jalen Collins, CB, LSU (6-1, 203 lbs. ): Has the size that NFL teams like. May have improved his stock into the 1st round. Looked a little bit tight when transitioning from his back pedal, but still looked good. Josh Shaw, CB/S, USC (6-0, 201): Shaw played both corner and safety for the Trojans. He only played in the last three games due to a suspension. He had good measureables: 4.44 40 (#4 DB), 26 bench press reps (#1 DB) and 10’10” broad jump (#4 DB), He will likely be given a chance as a corner and if he struggles, he could always be moved to safety. That’s it for my recap of the defensive players at the 2015 NFL Combine. Come back next week when I continue to discuss the path to the NFL Draft. This entry was posted on February 26, 2015 by draftmaniacs in All-Star Games and Combine and tagged 2015 NFL Combine, 2015 NFL draft, Bud Dupree, Byron Jones, Danny Shelton, Dante Fowler, Jalen Collins, Jordan Hicks, Josh Shaw, Kwon Alexander, Landon Collins, Leonard Williams, Malcom Brown, NFL, NFL Draft, Paul Dawson, Randy Gregory, Trae Waynes, Vic Beasley.